It’s been a while since my last blog (or confession) as life throws out those ugly curve-balls. Like cancer. My wife (best friend and soulmate) was diagnosed with metastatic breast cancer which was a devastating blow. But she is very strong and has faced this with the determination she typically has. Feeling pretty helpless and wanting to do something useful, my daughter and I took part in the Susan G. Komen 5K race for breast cancer in Boston, raising a lot of money for the charity thanks to the support from friends and family. It was a great day with around 1000 people taking part and with the family to cheer us on. Through most of this period I have had less inclination to be going out with the camera but recently have started going out more. It has also been a pretty lousy spring as far as the weather is concerned which isn’t helpful for landscape photography. I tried using the Skyfire app as usual but I may as well flip a coin. It’s been wrong more times that right but I don’t learn and I saw that the sunrise and sunset was going to be great in Maine this week so I made my way to Portland for a couple of nights. According to the app the sunset was going to very colorful! Now, I’ve been to Maine before and always have this vision of buying a cabin by a lake, writing a novel. Sounds a bit like a Steven King story-line, but you can dream. 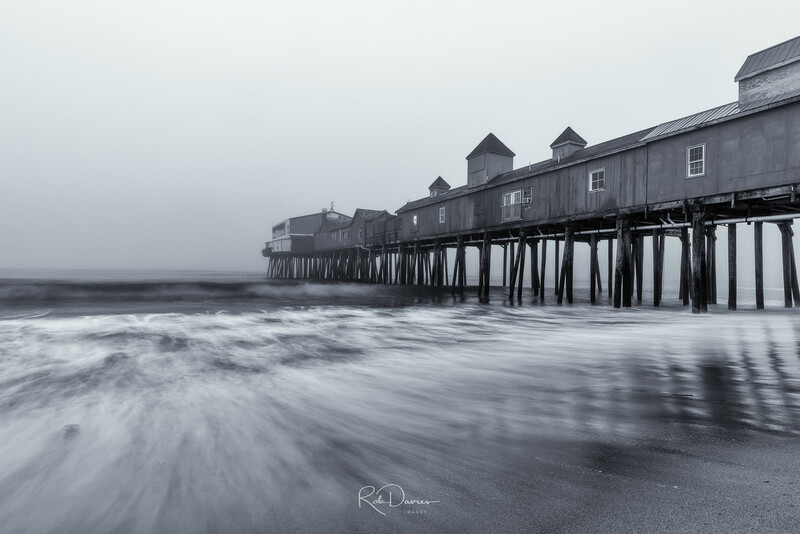 I planned to go to Old Orchard pier for sunrise and capture the light hitting those old beams of the pier. What I hadn’t planned for was a load of fog! The weather forecast and the app were off. Even while I standing on the beach unable to see beyond the end of the pier at 5.00am the prediction was for a good sunrise. This is how it looked at sunrise. The thing is, it is still a lot fun working with the waves and the motion, timing the shot, even if you don’t always get what you had planned for. In my mind, I’m thinking black and white for these photos. Alone on a beach in fog with the waves crashing is still exciting and powerful. Anyway, I still had the sunset at the lighthouse to look forward to. During the day I went into Portland Old Port and the harbor. There were some unusual wood pilings which made for interesting shots. 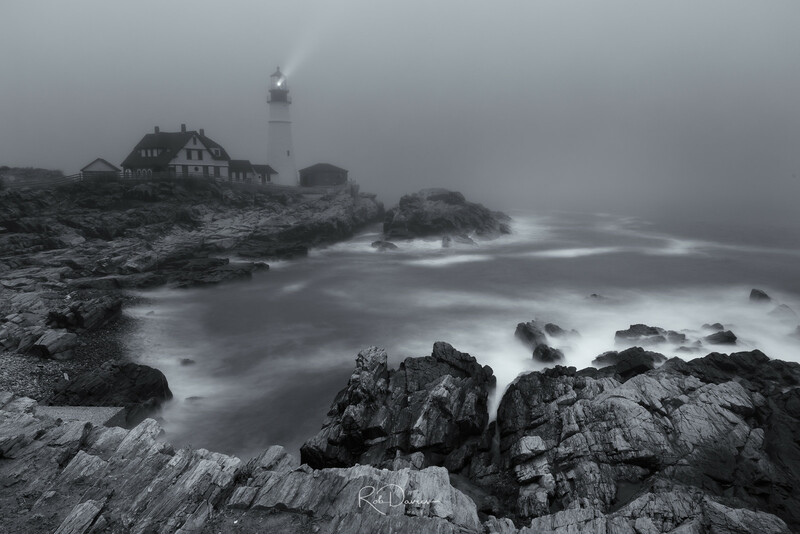 Portland Head Lighthouse is one of those iconic places. Instantly recognizable (especially in the New England area) and has hundreds of thousands of visitors each year, including scores of landscape photographers. If you are interested you can read about it here. When I got there, guess what. Yep, more fog!!!! 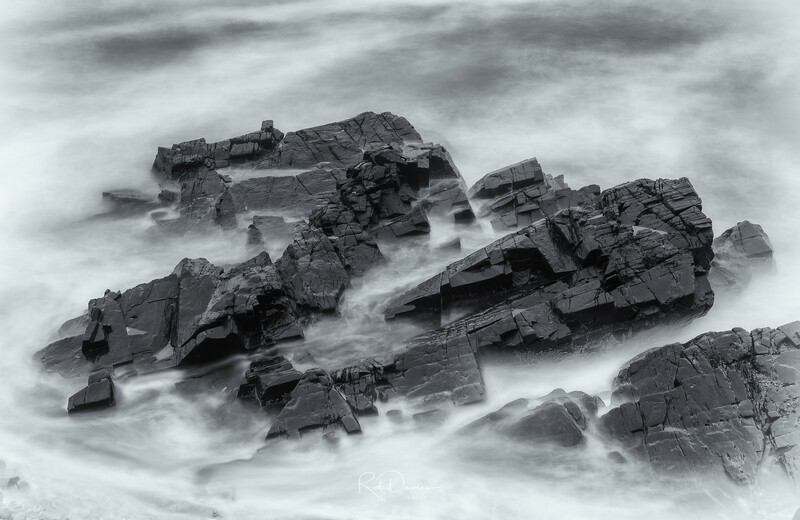 Time to get a bit creative so I made my way down to the rocks to take some long exposures with more intimate, detailed shots. Here’s an example. As for sunset, well this is how it looked. I think the fog makes for an interesting atmosphere, especially as the beam cuts though the fog. To create this shot I took two shots. I knew I wanted the long exposure on the water but I also wanted the light beam (which doesn’t work with LE). On the first shot I had the Lee 6 filter on for a 30 second exposure. I then removed the filter, adjusted the exposure and timed the beam to get a 1/15 sec shot. I was able to combine the shots in Photoshop to incorporate the beam from the second shot with the rest of the image from the long exposure image to give this after work-up in Silver Efex Pro 2.